Eccentric Lady is quite an enjoyable, gentle mystery novel. 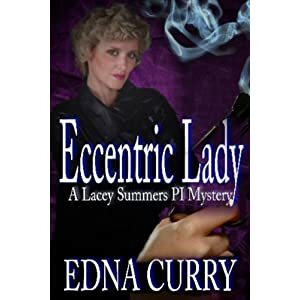 Lacey Summers is a private investigator tasked with the job of finding out what really happened to the eccentric old lady Agnes Simms, who was found dead in her car at the bottom of a lake. It is book 4 in a series but it can be read as a stand alone. I haven't read any of the previous books and I had no problem following the story nor the back story of recurring characters. The characters are well developed and there are plenty of suspects from the outset to keep you guessing. I was clueless right up until the last moment as to who the murderer was but the only quibble I had was that Lacey was also clueless! She didn't figure anything out by herself and it came to a head somewhat abruptly when it was all explained matter of factly by the perpetrator who just confessed all to Lacey during a kidnapping. So in that regards the novel fell a bit flat for me. It is a very fast read so it is perfect for a cosy day in front of the fire or a quick holiday read.